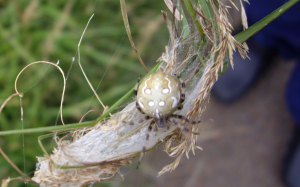 Observation - Four spot orb weaver Spider - UK and Ireland. Description: I think this is a female it was in it's weaved tube and came out as we brushed against the grass it was attached to. I think this is a female it was in it's weaved tube and came out as we brushed against the grass it was attached to.